Showing results by author "E.M. Foner"
Kelly Frank is EarthCent's top diplomat on Union Station, but her job description has always been a bit vague. The pay is horrible and she's in hock up to her ears for her furniture, which is likely to end up in a corridor because she's behind on rent for her room. Sometimes she has to wonder if the career she has put ahead of her personal life for 15 years is worth it. If you can read this, buy this book. On the other side of the galaxy, the Cayl Empire has decided to wind down operations and the Stryx are planning to pick up the pieces. Kelly is tapped to host an open house event on Union Station to tempt the aliens into joining up, but does anybody other than the Stryx actually want the merger to take place? The Wanderers have just moved on from Union Station, and the ambassador is ready to take her first vacation in 15 years. Unfortunately, the rules on paid vacation for EarthCent employees have changed for the worse, retroactively. Libby suggests spending some time exploring the station as an alternative, and Kelly cautiously goes along with it. Back at the embassy, while the cat's away, the mice will play. You're missing out if you don't already own this! Three years have passed, and the children are growing like weeds as Aisha grows into a new career. A mob of alien party animals has settled near Union Station like a plague, but nobody seems willing to see them off. They bring word of a new wave of helpful artificial intelligence, but perhaps there's such a thing as too helpful? The story picks up less than a year after the events of High Priest on Union Station, with Kelly coming to the conclusion that EarthCent needs an intelligence service. Of course, EarthCent has no institutional knowledge of what spies do or how they work, so the new agency gets off to a slow start. Then Kelly and the Union Station crew come up with a brilliant idea. 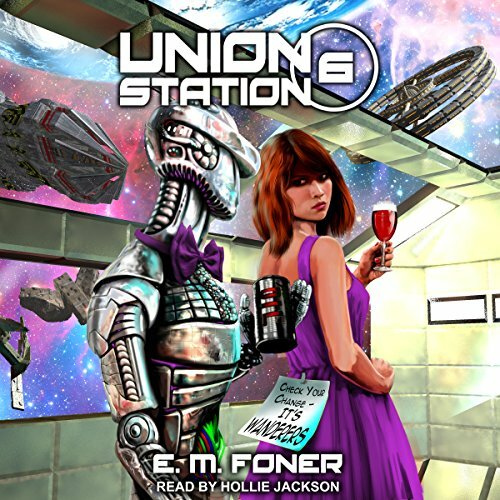 The first carnival to take place on Union Station since humanity joined the galactic community is coming, and the ambassadors of the different species are all entered in the election to become Carnival King or Queen. It's not a job that Kelly wants, and, fortunately for her, the humans get a late start at electioneering. One of the best series out there. While Kelly struggles to come up with a research project to apply for sabbatical, the role-playing craze reaches Union Station, and the Open University offers a for-credit LARP. Dorothy finally finishes her wedding dress with a technical flourish, and Jeeves plots to recoup his costs. Kelly returns from sabbatical and finally has the opportunity to expand her embassy with a conference room, providing she can find a contractor willing to take the job. Dorothy finds that her impending motherhood is an advice-magnet to her alien friends, while the SBJ Fashions workplace gets strange as Baa enchants fashion accessories for LARPing to repay her debt to Jeeves. Samuel and Vivian discover that their educational choices don't necessarily match with their aptitudes and abilities. Two years after the events of Alien Night on Union Station, Kelly faces new challenges as the EarthCent Ambassador. The growing acceptance of humans by their alien neighbors plus a measure of her own personal fame (or infamy) is resulting in too much work for an embassy with only two full-time staffers. Friends and family must wonder if the stress is finally getting to Kelly when she starts acting even more peculiar than usual. A new species has jumped into the Sol system for a quick look, leading the Stryx to assign humans to the greeting mission. Dorothy and Kevin leave on a trading mission in his new ship, bringing the dog, and Samuel and Vivian start at the Open University. Kelly has served as the ambassador on Union Station for more than two decades, but humanity remains on probationary status. When the Stryx inform EarthCent that their membership status is under review, Kelly goes all out to prepare for the test of her lifetime. Kelly heads to Earth for the first-ever Conference of EarthCent Ambassadors, but while the cat's away, the mice will play. My new favorite in an already favorite series.